Right now through 3/9/16, new DIRECTV customers subscribing to NHL CENTER ICE as well as existing DIRECTV customers who did not purchase NHL CENTER ICE for the previous season (2014-2015) are eligible to take advantage of this awesome NHL CENTER ICE Mid-Season Offer! With division titles and playoff spots on the line, this is the best time to catch all the action on ice. NHL Center Ice delivers up to 40 out-of-market hockey matches per week! DIRECTV gives you the marketing power you need to promote NHL CENTER ICE at your bar or restaurant. 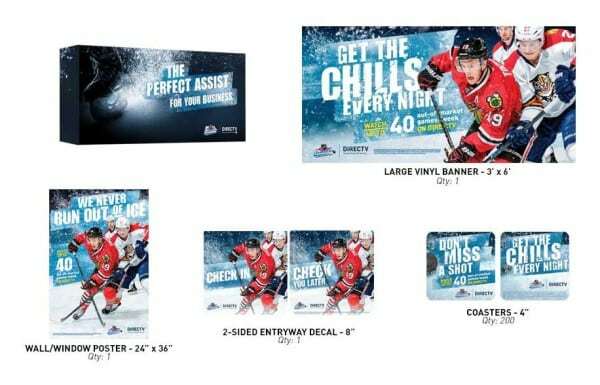 With banners, posters, coasters, and decals available to help you market the NHL to your customers. For 2015-16 NHL CENTER ICE Mid-Season pricing, click here. For the NHL CENTER ICE Mid-Season Profit Calculator, contact us at 800-951-1979.